We understand your time is important and we want to make things easy in seeing an orthopedic specialist. Visit our Orthopedic Injury Clinic at our Camp Hill or Harrisburg location. No need to schedule an appointment. Simply visit our Camp Hill or Harrisburg Orthopedic Injury Clinic to be seen by an orthopedic emergency care provider. Call 24/7 for orthopedic injury advice and care. When you experience an orthopedic injury, your first call should be to our orthopedic injury clinic in central PA. We’re the region’s first orthopedic injury clinic, and we have a long-standing reputation for being the most reliable location for all orthopedic emergencies such as strains, sprains, fracture or dislocation. When you visit our urgent care clinics in Camp Hill and Harrisburg, OIP’s knowledgeable team will first diagnose your problem. This may include taking x-rays and doing other examinations. After a diagnosis is made, we’ll suggest a treatment plan. While you’re at OIP’s injury clinic, you may also need to see one of our orthopedic specialists. 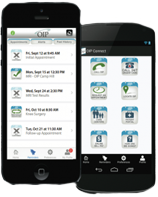 The waiting period is typically much shorter at OIP than at emergency rooms. If you need to see an orthopedic specialist, you can. Our co-pays are usually lower than the co-pays for ERs. We can offer comprehensive care onsite, including casting, splinting, braces, orthotics and x-rays. We have the lowest cost of any orthopedic urgent care facility in central PA.
Why go anywhere else? It’s time to rethink how you treat your orthopedic emergency situations. Visit OIP’s Orthopedic Injury Clinic today! Walk-ins Welcome. For 24/7 orthopedic advice and care, call us at 855-OUCH-OIP (855-682-4647). Weekend warriors and other recreational athletes have also discovered that OIP sports injury clinic is a place where they can get back on the court, in the game or to the gym. Many of our staff members are involved in regular physical activities, so they understand the athletic mindset. We’ll listen to what you want, and work to get you healthy again. Our goal is to have you feeling strong, and to keep your body moving. Contact our team today to learn more about our orthopedic injury urgent care services! What Are Orthopedic Injuries and Why Do They Happen? Orthopedic injuries encompass a wide range of musculoskeletal disorders impacting an overextended, overused body. Some injuries may involve stress fractures, or tiny cracks in bones used repetitively in a forceful manner. Shinbones of active athletes commonly experience stress fractures. The symptoms due to stress fractures frequently occur before any xray findings are revealed. For that reason, it is important that you be evaluated by an orthopedic specialist when you are worried about stress fractures. Our Camp Hill orthopedic emergency care providers may treat stress fractures by suggesting an individualized therapy program concentrating on strength training exercises to prevent excessive forces from reaching the bone. Sometimes, soreness and stiffness due to overexertion or incorrect form is treatable at home by resting, using cold compresses, and taking anti-inflammatory medications. When pain continues after several days and is accompanied by inflammation and swelling, something more may be going on than simple muscle strain. Although limited swelling is necessary for the body to progress from one healing stage to the next, some types of swelling may inhibit healing. When an injury causes bleeding into tissue, a swelling called a hematoma occurs that may require immediate medical attention. Swelling within joints is called an effusion and may lead to joint stiffness. If your injured joint feels like it wants to give out or buckle, you may have sustained a ligament injury commonly seen in ACL tears in the knee. Treating more serious injuries may involve our Harrisburg-based orthopedic urgent care physicians applying immobilization techniques to prevent further damage. Immobilization using slings, splints or casts rests the body part and allows blood flow to the area to encourage healing. Rehabilitative exercises may also be recommended to restore and strengthen damaged muscles and ligaments.